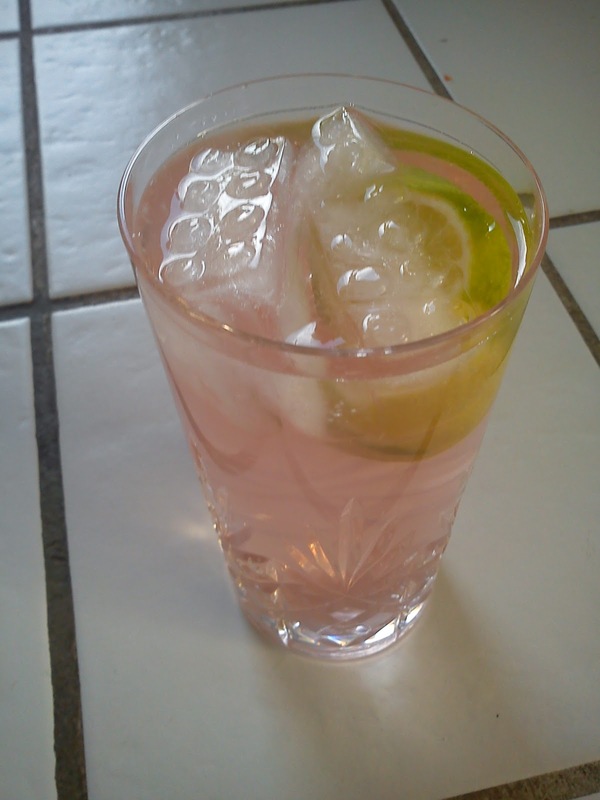 rabarberlimonade med gin og lime. So instead of making my usual gin & tonic, I decided to test this combination this wonderful summer evening without rain!!!!! It is also some time since, I have sharing a drink recipe with you, so here comes my version of this rhubarb drink with gin. 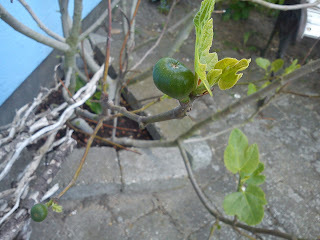 However, I am still on the look out for new fruit suppliers to the Rumtopf only with Danish fruit inside grown in people´s own garden. I cleaned the strawberries and divided them into half size. After weighing the strawberries I add them on top of the rhubarb inside the Rumtopf followed by sugar in half amount of the strawberries and finally I covered the strawberries with rum - Strohrum with 80% alcohol from Austria. 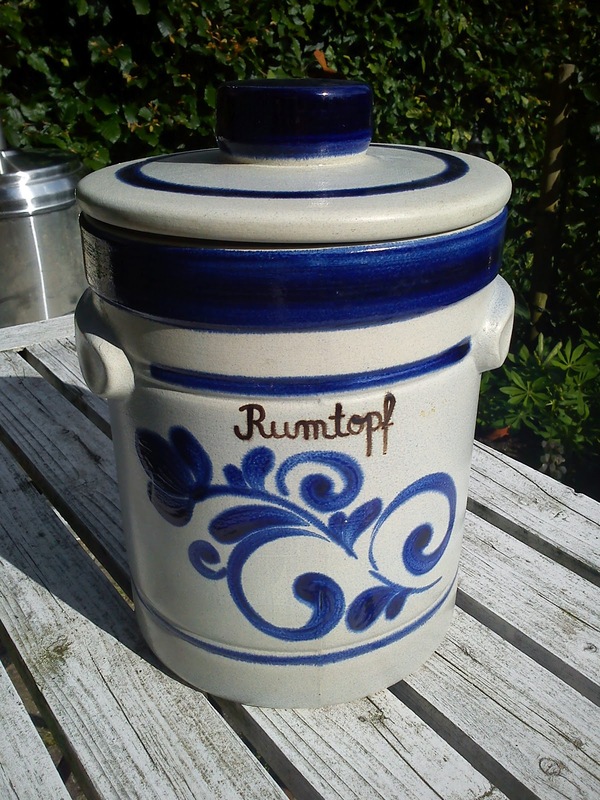 After gentle stirring the fruit content I placed the lid again on the Rumtopf, so I could keep the alcohol damps inside the Rumtopf. Some great friends came around last Sunday to celebrate my birthday, one month delayed. I bravely enough had invited for afternoon coffee/tea in the garden. And this is brave living in Denmark !!!! 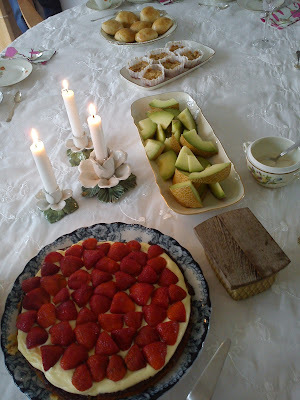 However, I had a plan B, which meant drinking the afternoon coffee/tea in-side, which were highly appreciated by my guests, as Sunday was a day full of rain. 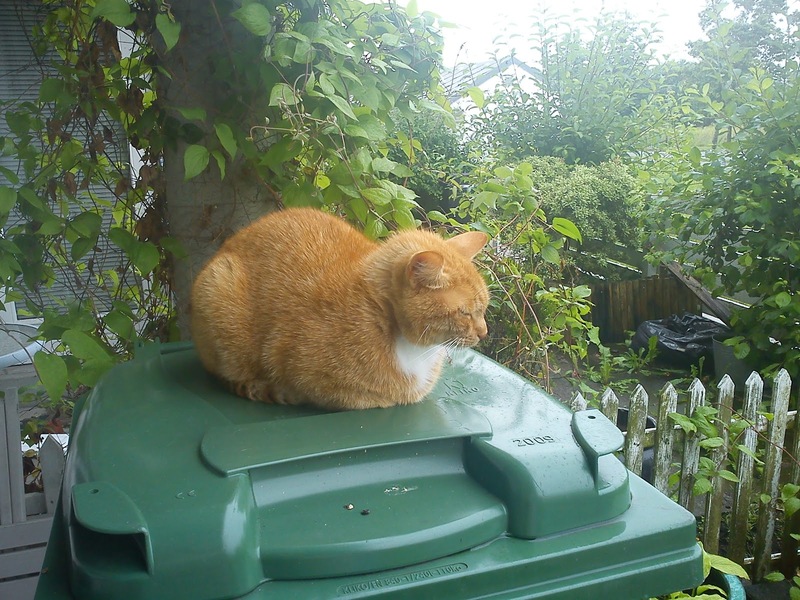 Even Hannibal the Cat was un-happy with the situation, as he dis-likes a wet fur, so he spend quiet some time sleeping on top of the garden garbage container !!!!! 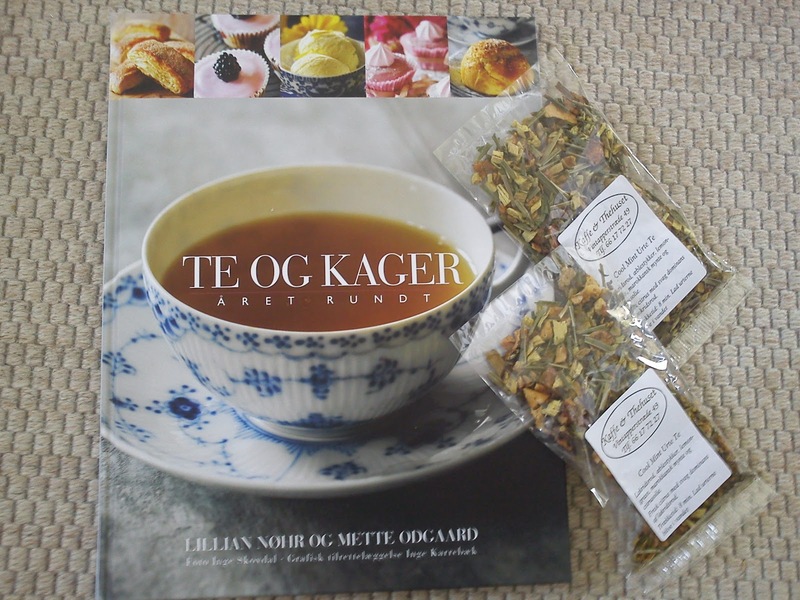 My good friends from Horsens had been checking my blog before leaving home in order to see, if I posted the "menu" in advance. But this was not the case this time. Also some of the birthday guests had expectation about me serving a new version of strawberry cake version 2.0, which this cake was not on the "menu" for this afternoon !!!! 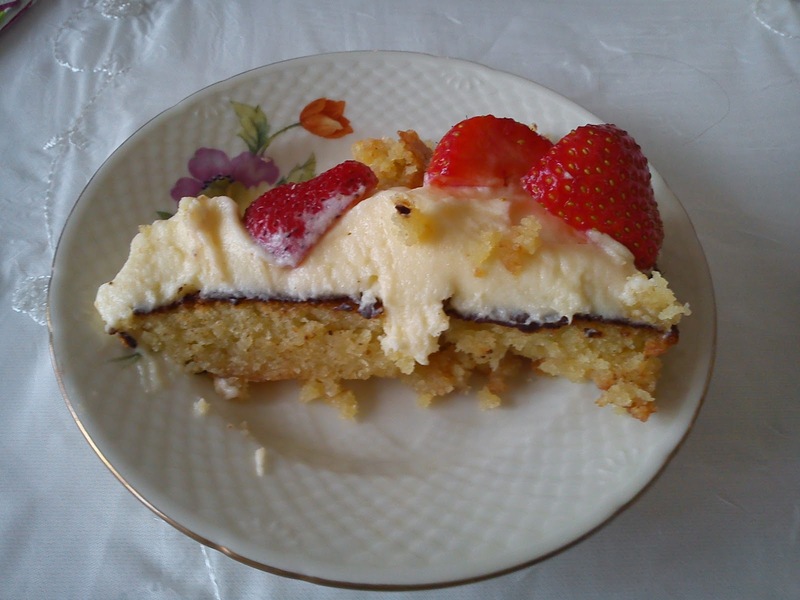 The birthday cake was made from sponge cake layer being brushed with blackcurrant rum before applying vanilla cake cream and fresh strawberries. I ended up by mixing left-over of the blackcurrant rum with icing sugar. The side of the cake was decorated with whipped dairy cream. As final touch I added birthday candles. 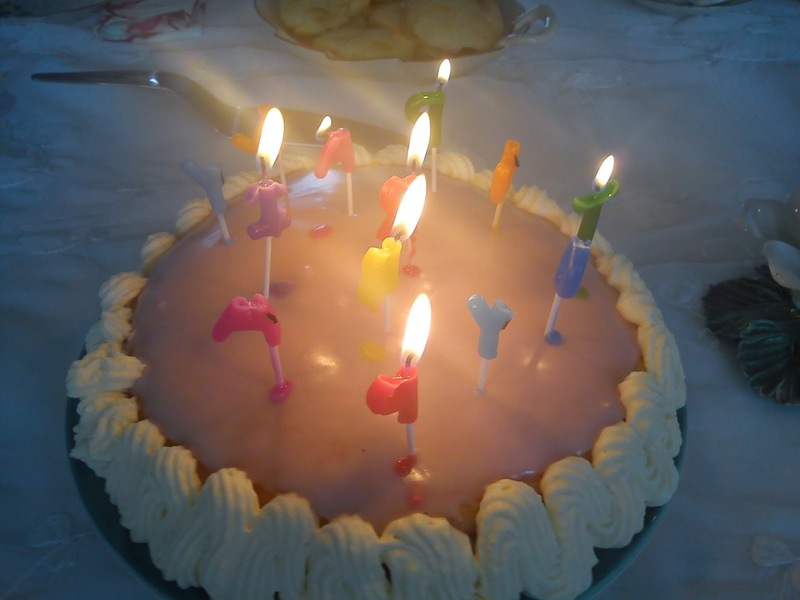 However, these candles did not perform according to my expectations, as they only lasted a very short time combined with dripping searin on the icing. One part of the birthday gift to me was this cooking book called "Te og kager - Året rundt" by Lilian Nøhr & Mette Odgaard. 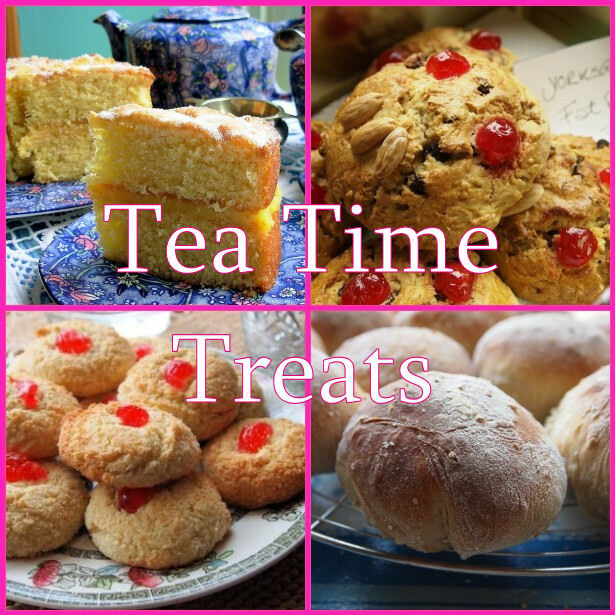 I am very much looking forward to try all these afternoon tea recipes in my kitchen. Yesterday I picked up the rumtopf at my friends in Horsens on my home from work. They were not at home, but I had been told where to find the rumtopf. 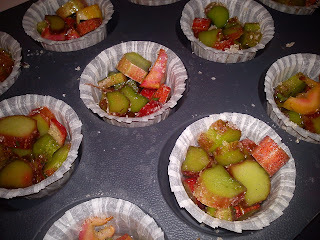 My friends had started up my Summer Challenge by adding rhubarb into the rumtopf. 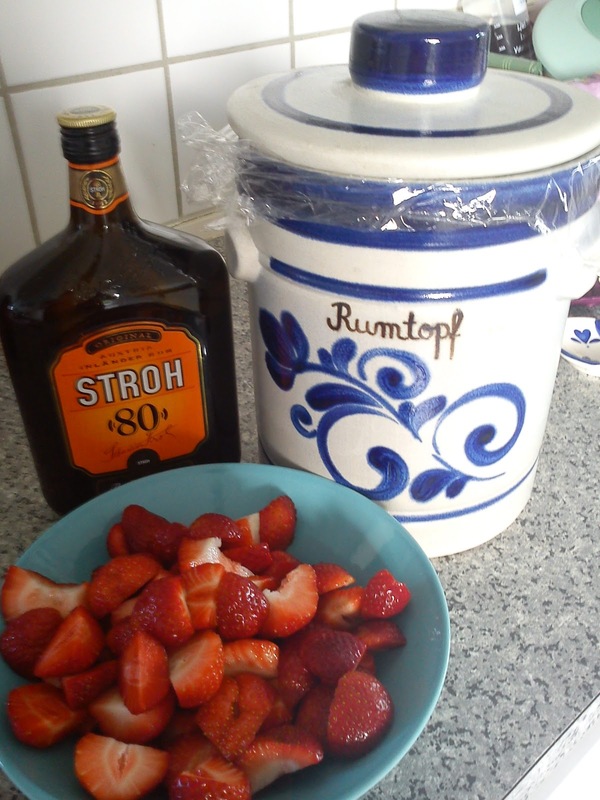 And tomorrow I will get a small container of Danish strawberries from a work colleague to put into the rumtopf as the next rumtopf resident. Doing my best last Summer to put the Summer on glass for later use during a cold Autumn-Winter making various fruit alcohol, the next logical step for me would be to follow in the foot steps of Camilla Plum, who in her cooking programme "Mad der holder" during 8 episode made rumtopf using the fruit in season. You can her recipe here: Camilla Plum rumtopf. During a nice afternoon tea table spend in Horsens with some very good friends we talked about making rumtopf, and it turned out, that my friends actually had an original rumtopf pot incl a bottle of Strohrum. And they very friendly "donated" the Rumtopf incl. the first bottle of rum, so it could spend 2012 in my little kitchen. My next idea on making rumtopf is, that my friends and colleagues should donate fruit surplus from their gardens to the rumtopf, In my opinion it would be "too easy to make" this rumtopf just buying the fruit content from the supermarkets !!!! So therefore this little twist to my Summer Challenge :-) And yes, friends and colleagues have been informed by me about their "responsibility" and have all agreed to join in (without too much pressure). 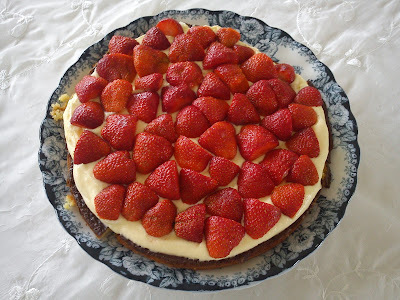 I have a dream - a dream about making my very own ultimate/perfect strawberry cake, as I find the price on this type of cake at the bakers to be highly over-priced !!! I am approaching this dream by taking one small step followed by another one small step, and this will slowly make my dream come true. Or by using the words of another: "one small step for me, one giant leap for strawberry cake" !!! So I am starting from the very bottom of the cake, so starting on getting the cake layer perfect. 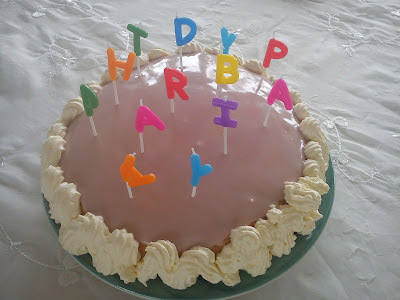 Last year I tested one suggestion of cake layer, which was good, but not perfect. This time I have talking to a professional baker a work, who gave me the following suggestion for the cake layer. And this Mazarin cake just taste great, perfect, lovely - so I will use this recipe for my coming work on creating the ultimate strawberry cake. It turned out to be very difficult for me get the Mazarin cake out of my silicone form into one piece. 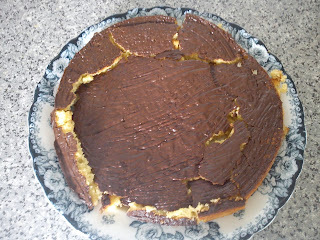 However, this is not visible to see after you have place the vanilla cake cream on top of the Mazarin cake. 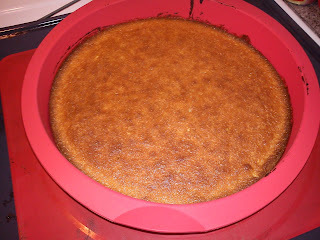 Next time I will make a shortcrust pastry dough for filling the Mazarin cake dough into before baking it. I used a "plain" vanilla cake cream made from cold-soluble powder mix. 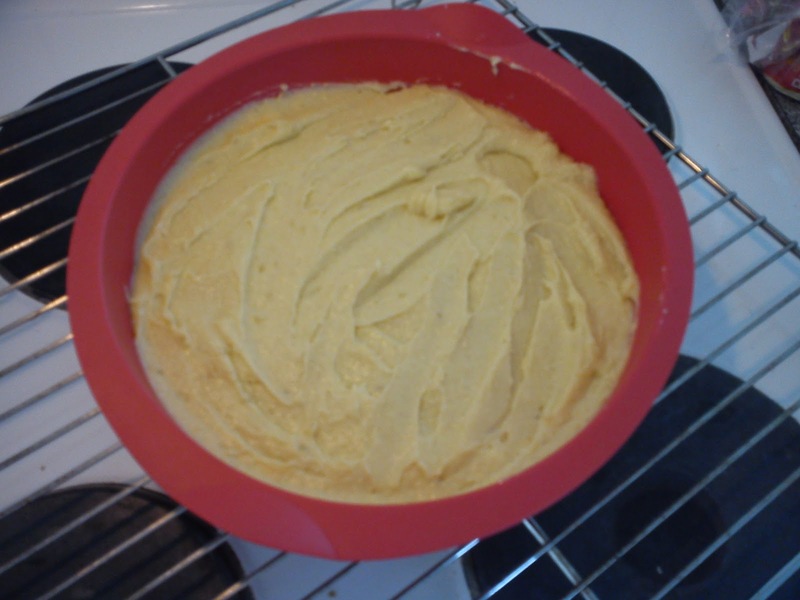 However, I reduced the amount of milk added, as I whipped some dairy whipping cream, which I mixed together after the maturation of the vanilla cake cream. Making my own vanilla cake cream will come later on as another small step on my road to creating the perfect strawberry cake. As my rowing friends could not eat the entire cake, I took the rest of the cake with me to work, where it disappeared with 5 minutes during the afternoon coffee/tea break. I take this a sign, that this cake tasted very, very good indeed. Heat the oven (conventional) to 200'C. Stir/whip the sugar and grated marzipan together until homogeneous mass. Add the soft butter in the sugar-marzipan mass until the mass is homogeneous again. Stir the egg, one by one, into the mass until it is homogeneous again. Add the flour at the very end. Do not stir the cake mass too much, as this can result in, that the cake is boiling over during baking. Fill the cake mass into an oiled round form of approx 28 cm in diameter. Bake the cake at 200'C for 20-25 minutes. Melt the chocolate (I use the microwave oven for this purpose). Cover the surface of the cake with melted chocolate. Let the chocolate firm up. Take the cake of the form and transfer it on to a plate. Place the vanilla cake cream on top on the cake. 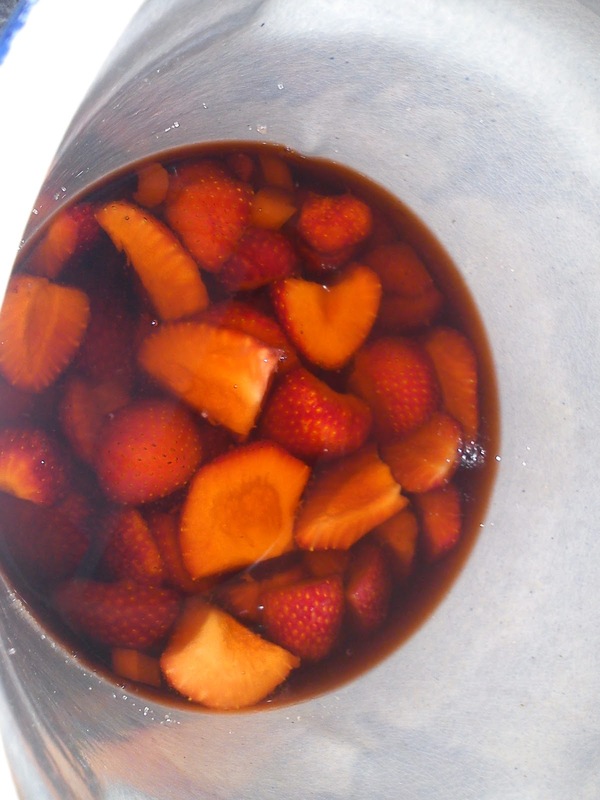 Decorate with fresh strawberries cut into half. Rhubarb season again and with the help of a good working colleagues I was able again to test out a new recipe of rhubarb cordial, which time a recipe from Dansukker. 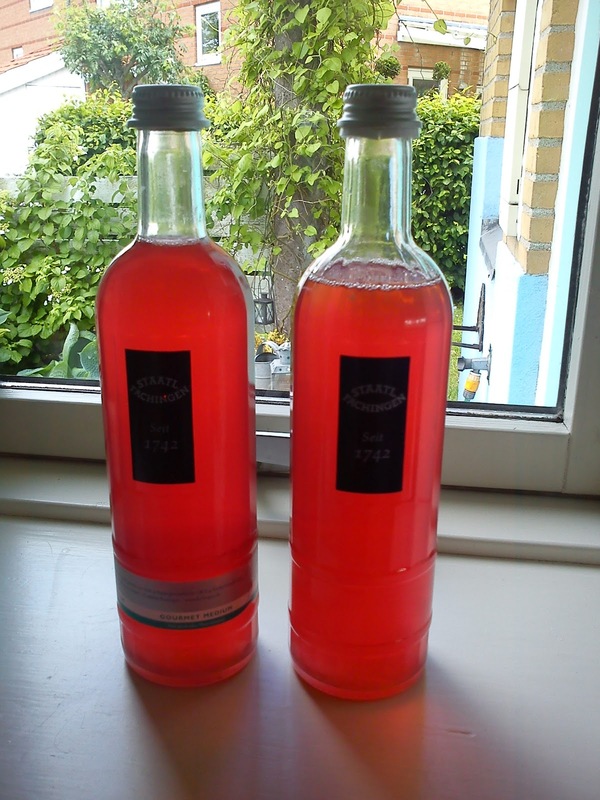 This rhubarb cordial can be mixed together with either plain or sparkling water. You can also use it as flavour addition to white wine or sparkling wine as wonderful tasting aperitif. Cut the rhubarb into pieces of 2 cm. 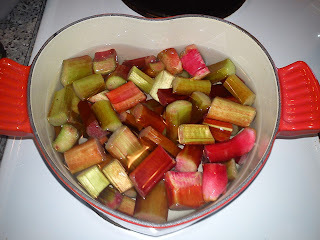 Add water and rhubarb into a the cooking pot. Cook it up and left it cook for 5 minutes. 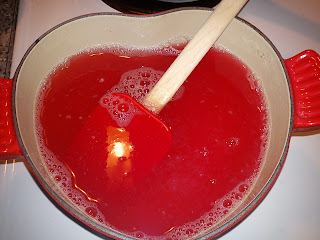 I prefer to keep the lid on the cooking pot on as much as possible in order to keep the volatile part of the rhubarb flavour inside the cordial instead of loosing to the air. 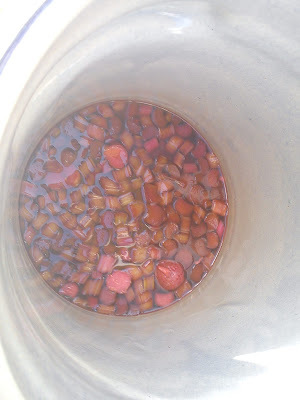 Remove the rhubarb pieces from the cordial part using a sieve. Mix rhubarb juice, lemon juice and sugar together. Cook the rhubarb cordial up to the boiling point. 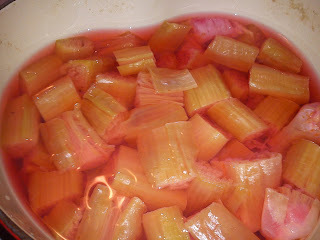 Pour the hot rhubarb cordial into bottles, which have been standing with boiling water for 5-10 minutes. Store the rhubarb cordial in the refrigerator or freeze, as it no anti-microbial have been added. 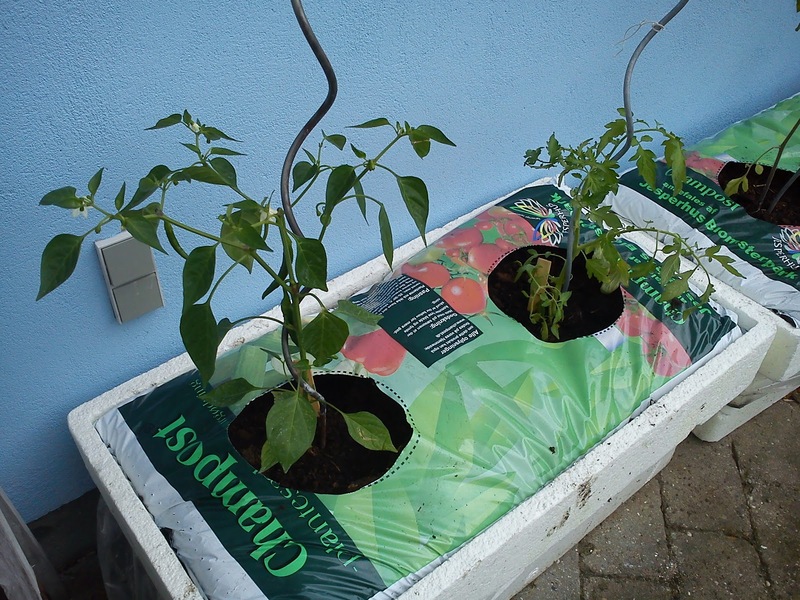 Last week it was finally time for me to plant tomatoes and chili in the little kitchen garden. 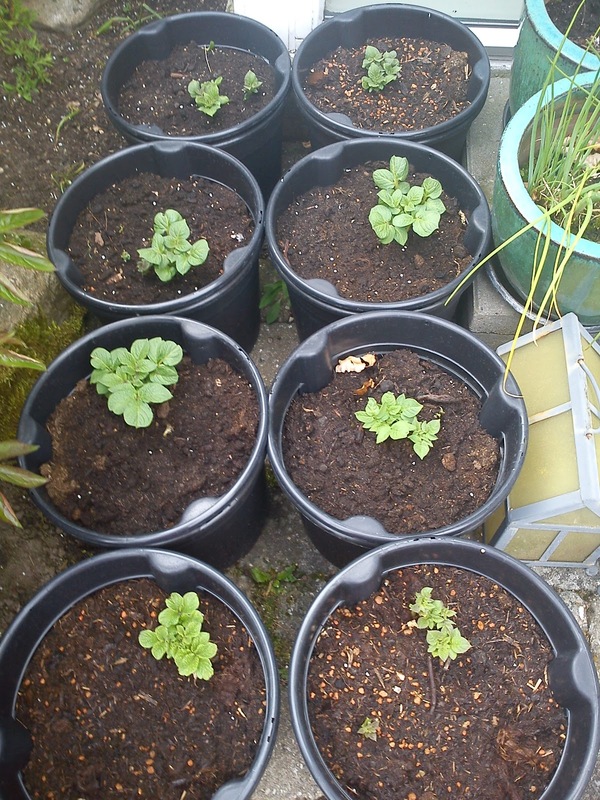 As these plants NOT are being protected by glass or any other type of shelter standing on the terasse against a south facing house wall, I have to be patient and wait until beginning/mid June, so I am sure the last chance/risk of night frost is over. Planting my tomatoes so late also means it is quiet tricky to find someone actually selling tomatoes plants, as most Danes are growing their tomatoes in green house or in shelter places and therefore buying these tomato plants already in end April or beginning of May. 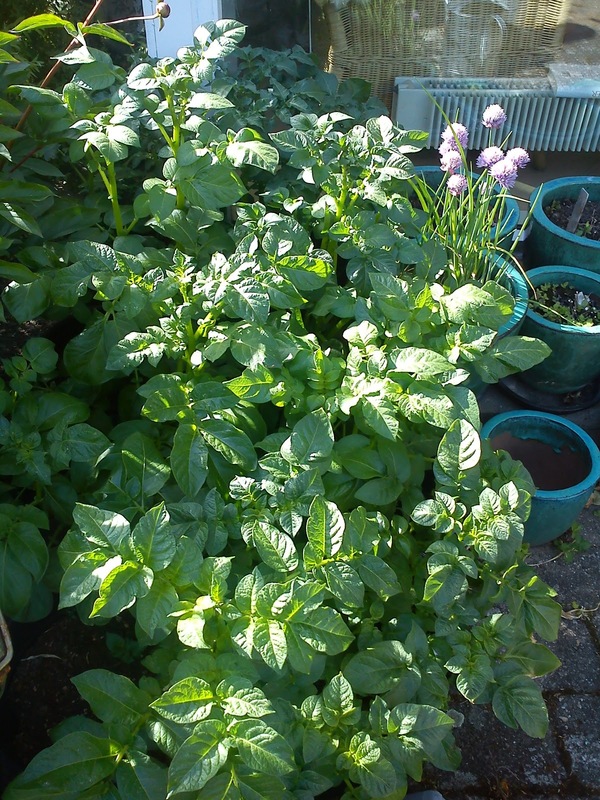 However, I noticed, that the market gardener is selling tomato plants, chili plant and various herbs at the local market in my town centre, so I have been using the options for the last years for finding the plants for my kitchen garden. This year I have brought a chili plant and three different tomato plant, one free land tomato, one cherry tomato and one Greek tomato. I am planting these plants in a bag of planting earth, which is placed on top of box full of water (approx 70 liter of water). 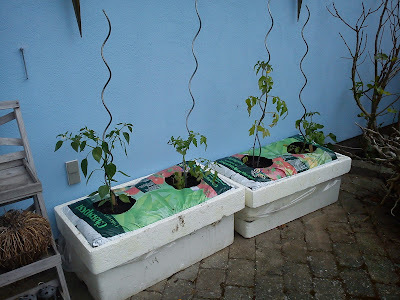 This means, that you only have re-fill these planting box with water every 8-14 days depending on how warm the weather is. And approx 7-8 weeks after planting potatoes I am having pots looking like a jungle. So soon I am hoping to picking my very own potatoes from these pots. I will keep you posted on this progress. I have been working further on this first version of Lønnestræde´s squash buns, increasing the amount of added squash and as well as using some butter. And I quiet satisfied with this second version, as they are soft and moist from the added butter and increased level of squash. It is also a good way of using the frozen squash from my freezer, before this years squash season starts again. During the high season of squash, where friends and work colleagues are having squash up to their ears, I "help" them by using some of the squash harvest from their gardens. So some of the squash surplus I grated and freeze down in portion of a size of 2½ dl grated squash. These squash buns are also great to freeze down, which I do right after they come out of the oven. And when I defrost in connection with rowing tours, where I need something to eat during rowing. Weigh the flour, salt, yeast, honey into the mixing bowl. Add butter pieces, grated them into the flour mix. Add the milk and egg into flour mix. 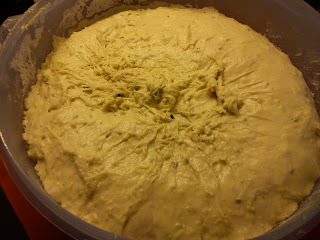 Add the grated squash in the dough mix. Knead the dough. Here I am also using my interpretation of the Richard Bertinet method. I knead on time - 10 minutes. Raise the dough warm for 1-1½ hour. 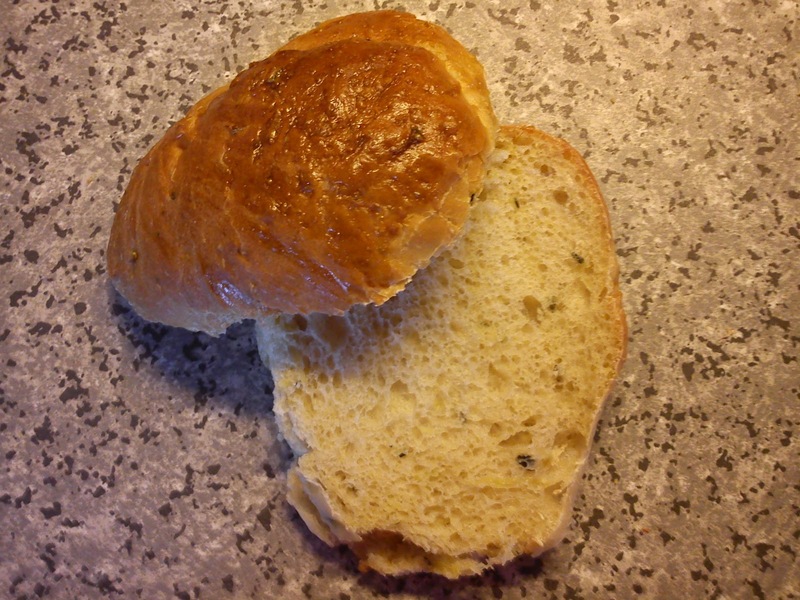 Rework the dough - scale each wheat bun to weigh around 80 g - so you get an even baking time for each bun. 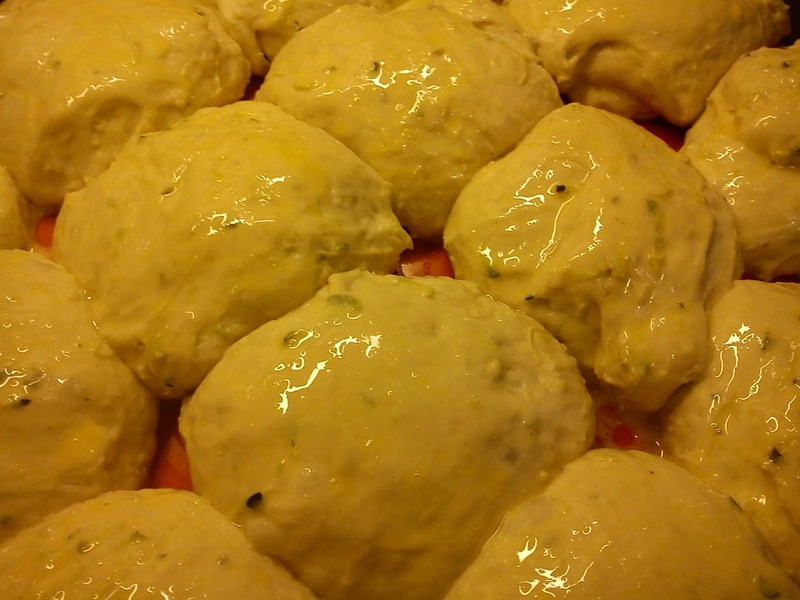 Place each bun in a baking tray covered with baking paper - let the buns raise for another ½-1 hour. Bake the squash bun at 200'C for 20 minutes. Cold down the bun and enjoy eating them. It is giving us the opportunity of meeting up in "civil" wearing more our normal clothing instead of always seeing each other in more or less flattering rowing cloths and without make-up. 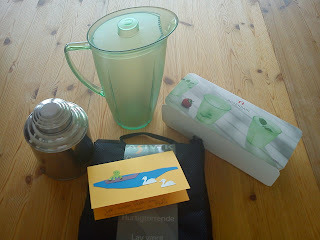 And I got some lovely birthday presents - light weight fast-drying towel for a up-coming rowing vacation, some plastic glass and jug from Rosendahl intended for use out-side in my garden and nice tea tin. And have a look at the birthday card, which one of my rowing friends had created for me. 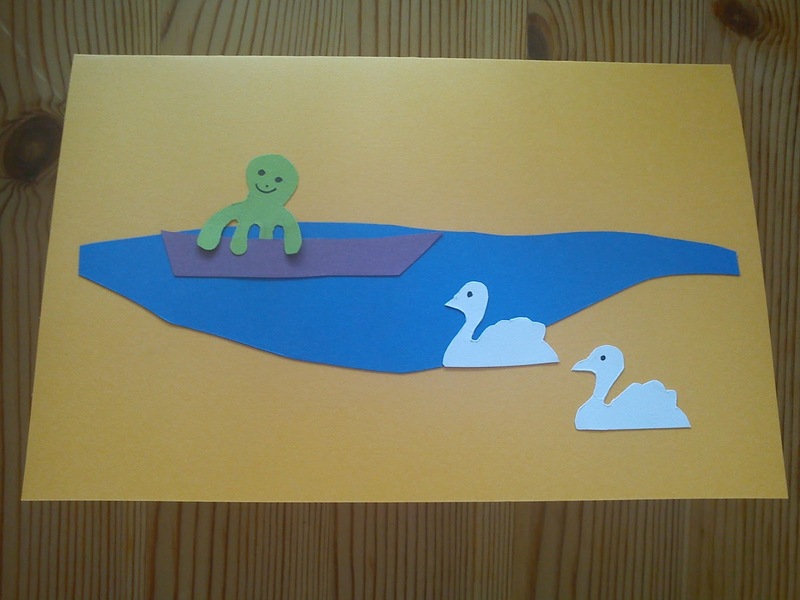 I am the green octopus in a rowing boat on the Fjord of Vejle with two swans. I really like this card, so I am planning to place in a frame in the near future. The blog event called "Tea Time Treats", which is a monthly baking challenge event managed Karen from Lavender and Lovage and Kate from What Kate Baked. 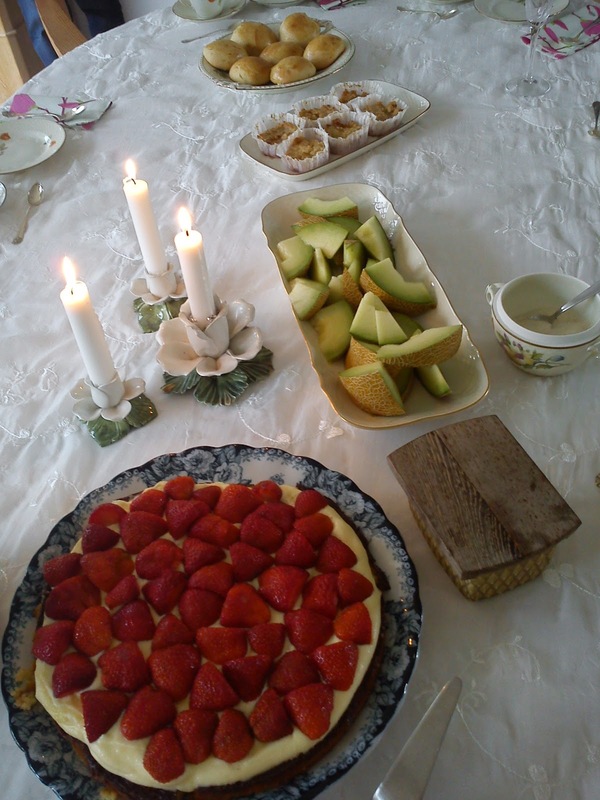 It is Kate from What Kate Baked, who is the virtual hostess for this very month of summer time, even though the weather is not fitting with my description of summer, the theme for is for sure "summer fruits" whatkatebaked.blogspot.tea-time-treats-june. And it is clear to see, that rhubarb cake is a strong winner of this cake vote. So yesterday evening I baked rhubarb crumble in single servings, so they were easy for me to bring on the annual Constitution Day Picnic Row. 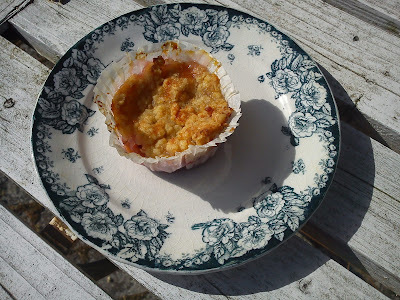 But an un-kind and strong wind of 8 m/s in average cancelled this celebrations of ours today :-( However, most of the rowers are coming around for the first round of my birthday celebration Thursday evening, so I am "saving" these rhubarb crumble for this occasion, if I can keep them out of my mouth !!!! 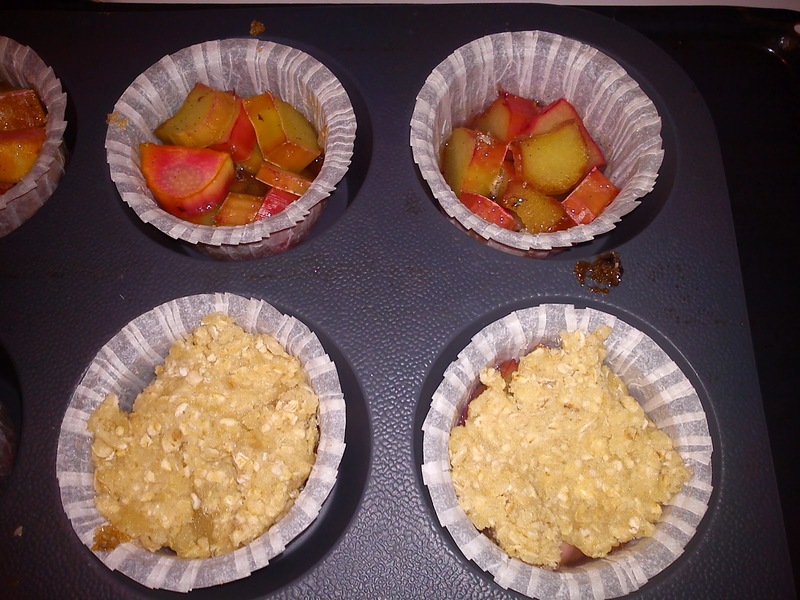 as they are having a wonderful fresh taste of rhubarb combined with sweetness coming from the marzipan used in the crumble topping. Mix rhubarb, vanilla sugar, sugar and garden mint together. Top the baked rhubarb with a layer of crumble. 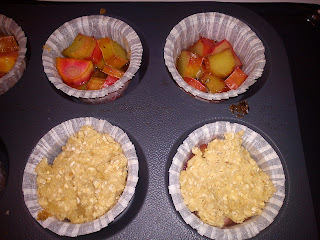 Bake the rhubarb crumble at 200'C for another 20 minutes.